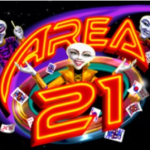 Area 21 is a Cryptologic developed game (even though it is now owned by NYX Interactive). 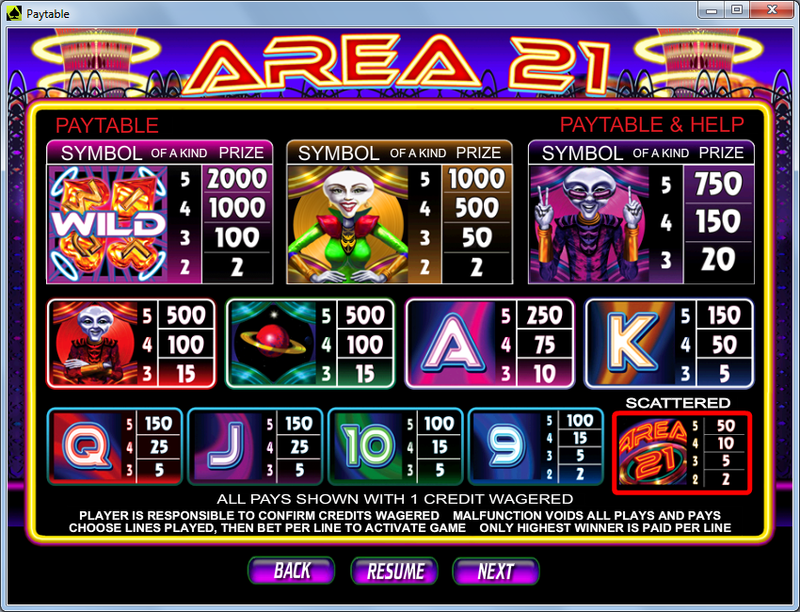 The slot is a very cheesy, very 60s take on alien lifeforms. 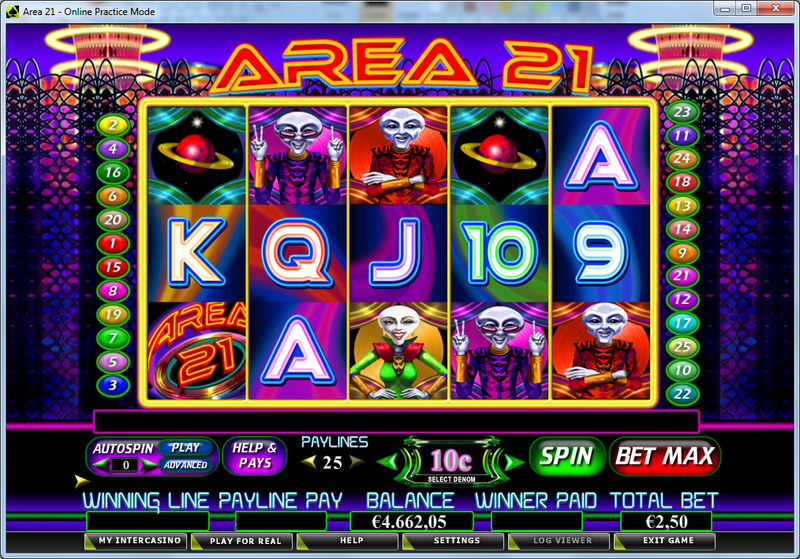 Based on the Area 51 myth, this slot machine game is friendly, zany, and quirky. It features a total of 5 reels and just 25 paylines, all of which can be adjusted by the player. Players can also select coin values which range from 0.01 up to 20.00 in all. As you can imagine, this gives the Area 21 slot quite a wagering range, which extends upwards from 0.01 per line per spin, to 500.00 per spin in all. Players can expect to win as much as 2,000 coins in all if they strike it lucky playing the Area 21 slot. There isn’t too much in the way of special features in this slot machine game. A wild symbol can appear on the reels and substitute for all other symbols in the game, barring scatter icons. It also doubles up as the best paying symbol in this slot. Scatter icons appear as Area 21 logos, and as well as dishing out scattered wins, these symbols can also trigger a Blackjack Free Spins bonus round when 3 or more appear in any position on the reels. 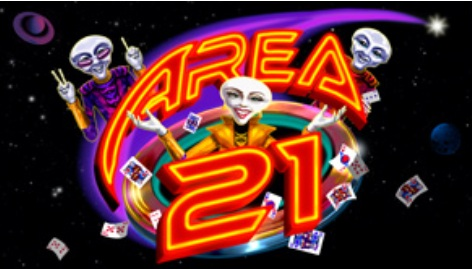 It is this Blackjack Free Spins bonus round where the Area 21 slot gets its title from. At the beginning of the bonus round, players will play a hand of blackjack against the Alien Dealer, to determine the number of free spins and potentially multipliers the player will start the bonus with. Splitting and doubling down are possible in this cheeky blackjack bonus round. Players who lose will start the bonus with 10 spins and a 2x multiplier. Players who beat the Alien Dealer will begin the bonus with 10 spins and a 3x multiplier. Splitting hands and winning offers you 10 spins with 3x multipliers. Doubling down and winning offers you 20 spins with a 3x multiplier. Beating the Alien Dealer with blackjack can see you win 25 free spins with a massive 5x multiplier. The bonus rounds in this slot are inventive, exciting, and make what would otherwise be a rather dull slot machine hugely entertaining and exciting.